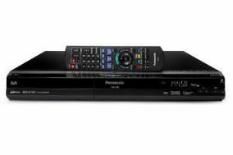 Panasonic DMR-EX88 review | What Hi-Fi? Are you addicted to TV? If so, you could well find the Panasonic DMR-EX88's recording ability a godsend: use its lowest-quality EP mode to store your TV programmes on its 400GB hard disk, and you can record up to 712 hours – nearly 30 days – of telly! More likely, of course, is that you'll want the best possible quality for your recordings: using the optimum XP mode, the Panasonic's recording duration drops to 89 hours, which is still enough, by anyone's standards. The 'EX88 is in most other regards identical to its cheaper siblings tested already (the DMR-EX768 and DMR-EX78). So, you get a single Freeview digital TV tuner with Freeview Playback support, no analogue tuner (buyers beware) and potent video processing, including both 1080p upscaling and Adaptive Noise Reduction to reduce digital block noise in TV signals. As with its siblings, the Panasonic also claims support for Deep Colour, although the dearth of source content offered in that form makes the issue rather moot. Still, with 400GB to play with, the DMR-EX88 status as an affordable media server is certainly appealing. There's enough hard-disk capacity for your whole music collection, with artist, title and album information automatically sourced from the built-in Gracenote database. Music performance is perfectly listenable, too: not necessarily a rival for a good CD, of course, but acceptably articulate judged by the standards of most music server products in this price class. Alternatively, home video fans might well be drawn to the 'EX88's SD card reader, which allows for easy transfer of MPEG2 video content from digital camcorders and cameras. Backed up by the same array of USB and Firewire sockets found in the DMR-EX78, this covers you for any editing eventuality. It'd be all-too-easy for all this flexibility to become overwhelming, but the DMR-EX88's usability is exemplary. The on-screen graphics are excellent, the thumbnail navigation system for the hard disk makes flicking through your recorded content a joy – even the remote handset is a doddle to get to grips with. You just need to ask, "Do I really need all that capability?" If not, buy the 'EX78: it's identical in performance, and £100 cheaper. But if you want the best there is, and price isn't an issue, go for a DMR-EX88 with our blessing.